Everyone has different opinions about Chinese designed and manufactured products, of which the Broadcare cordless water flosser are one. Whatever your thoughts, what you have to hand to them is their ability to create excellent value products. Now I dare not suggest that the Broadcare cordless water flosser is a copy of other popular cordless water flossers, but there are a lot of similarities. The best bit is though the resulting product performs pretty well and is a bit cheaper than the branded alternative. Which one you want to go for is up to you, but safe to say the Broadcare for many is a good investment. If you’d like a more detailed comparison of water flosser options, see our posts on the best water flosser and the best cordless water flosser. 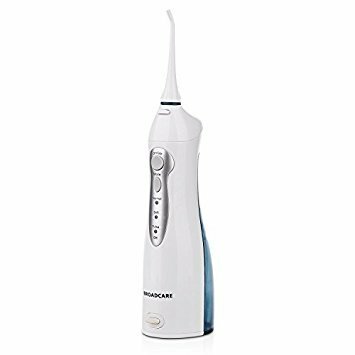 What is the Broadcare Cordless Water Flosser? This is a cordless device that takes water stored in a tank and pumps it out at a high pressure. You move the water jet around the mouth, in between teeth and along the gumline to wash away plaque, bacteria and food debris. It is an alternative to the task we all love, flossing! Press the mode button to select the desired option and then press the power button to turn it on. When complete, press the power button to turn it off. Using water to floss is something that has actually been around for a long time, however when it comes to flossing the general recommendation has and to a large degree is to use string/tape floss. The statistics vary, but it is well documented that in reality few floss regularly, like we should. Often, the reason why is because people find it painful, awkward, time consuming and can’t see the benefits, particularly when some of the clinical evidence is lacking. But with 35-40% of your tooth surfaces not being cleaned by regular brushing there is a need to complete some form of interdental cleaning. Water is an easier, softer and more enjoyable way to achieve this. Market leader Waterpik has conducted a lot of research and highlighted the significant oral health benefits of flossing. Did you know the pain and bleeding often associated with flossing is actually because you have not been flossing?! So, how good is the Broadcare cordless water flosser? Read on to find out. Here are some of the pros and cons of this flosser. Price – It is cheap and more cost effective than some of the bigger brand name options. Modes – 3 different modes to appeal to different users. Nozzles – Only one style of nozzle and only one included in the box. Proprietary charger – The bespoke power adapter connection and rubber cover for the charging port are annoying. Messy – Not a product con as such but more as a result of how water flossers work, it can take some time to get used to the right technique and avoid making a mess. Given that this product has a 150m/5.2ozl water tank on the back of it, there is a certain chunkyness to the water flosser. It comes in a fairly plain, simple and no nonsense box. The unit itself feels like it could be a bit smaller, but I suspect every effort has been made to keep things as slim and light as possible. It is not all that heavy in hand and the weighting and the position of the grips lead you to grip the upper third of the brush handle and it is here where the control buttons are placed. There are three key parts to the flosser. The water tank, the main handle/unit and the nozzle. They detach from one another. The water tank on the back of the unit slides on and off and is made from an aqua blue plastic. Holding 150m/5.2ozl of water, there is a small hole towards the base of the tank which can be accessed by a flip style lid that seals over the hole. The upper half of the tanks has some contoured grooves to which the fingers naturally fall and grip to when in hand. Feeding into this tank is a tube that connects to the main body/handle to pull the water into the pump and up through the nozzle. White in color is the main body of the unit, smooth to the touch on the centre of the unit is a sort of teardrop shaped silver panel where the main controls sit. At the top is the largest round button that is the on/off button whilst below it is an oval mode button. Press the mode button to change between the normal, soft and pulse operating modes. Each of these modes are marked below the mode button with an LED that illuminates Blue to show which mode is selected. What I do like is that the unit remembers which mode you have selected and the mode can be changed before powering it on. Just press the mode button the appropriate number of times until such time as the mode you require is selected. Towards the bottom of the unit is the Broadcare logo in a bold black font and below this, the charging port. There is a rubber plug/cover that goes into the port and extends from the handle. You pull this out to access the proprietary charging connector. This cover goes in only one way and is not attached to the unit so it could be easily lost. The job of the plug/cover is to protect the port from water. Frustrating is the proprietary charger, but one comes supplied. It would be nice if it was microUSB or similar. The power cord supplied is 2 pin US with 100-240v support. The cable is 175cm/5.8ft long. It can take 8 hours to charge the unit. The third part of the unit is the nozzle. This is the bit that feeds the water from the unit into your mouth. Two nozzles comes supplied in the box. These clip into the hole on the top of the unit. It needs to be pressed in firmly and you will hear it click into place. A button just below the nozzle attachment on the top of the unit has to be pressed to release it. It is a tight fit and might require a bit of force. It does not clip in and out as smoothly as Waterpik products. The nozzle comes with a colored band around the base of it that allows the item to be identified. For example you can have different colored bands on each nozzle for different users, just like Oral-B brush heads if you have seen these. The nozzle tapers up to a fine point at the top. At the base are a series of fan like ridges that run around it. These act as grips and allow the nozzle to be rotated a full 360 degrees. It was quite stiff on my unit to twist this. The nozzle should be replaced ideally every 3 months. You can purchase packs of replacement ones quite cost effectively. $8 for 5 replacement nozzles. When you are ready to begin using it, fill the tank with water, many prefer slightly warm water. Having said this the manual says do not exceed 40 degrees celsius. Make no mistakes if this is your first time using a water flosser the process does take some getting used to and you may very well cover your bathroom in water the first few times. Aim the tip towards the teeth at roughly 90 degrees, and turn the unit on. Start with the back teeth and work toward the front teeth. Glide the tip along gumline and pause briefly between teeth. Continue until you have cleaned the inside and outside of both the upper and lower teeth. Slightly close lips to avoid splashing but allow water to flow freely from mouth into the sink. Keep unit upright during use for best results. If you struggle, persevere, it will get easier. Depending on the mode, the Broadcare flosser will deliver water at 40 to 90 PSI with 1400 pulses per minute. The 3 different modes are normal, soft and pulse. Normal is the most powerful and most effective, but might be too powerful for your first few goes or if you have sensitive gums. The soft mode is the most gentle and a great option to select to ease you in. Pulse is a different approach and is designed to massage the gums. In all instances, the intention is to wash away bacteria, plaque and food stuffs to leave your teeth cleaner and healthier. In particular it can reach under the gums where normal brushing can’t. The manufacturer suggests a 99% effectiveness but it is not clear what if any studies have been carried out to confirm this. No doubt it will a marked improvement on bacteria removal but I have not conducted clinical studies into this. The water is softer on the gums than normal flossing and quite quickly if you have sensitive or bleeding gums you will notice a reduction as a result of the bad bacteria being removed. Flossing is a way of preventing plaque buildup and the onset of gum disease. The different modes work for different users whilst the rotatable nozzle allows all to adjust the stream of water that comes out of the unit to try and get into all the gaps in the mouth. In any of the modes you will get 30-35 seconds usage time from the tank of water. That does not sound like a lot, but when you consider the volume of water, the power and actually start using it, for most this is enough time. If you wish to floss for longer, you will need to refill the tank. When running it makes a bit of a noise, it is not super loud, but it is not quit, after all there is a motor pumping water up and out of the unit. Built into the unit is a minute timer. The unit automatically powers the flosser off after this time to prevent wasting the power that is in the internal battery. It’s a nice feature, but given the water will have run out some 90 seconds before, most would just switch the unit off. The unit is water resistant to some degree with the plug that goes into the charging port, but it is not waterproof and should not be used in the shower or bath and certainly should not be immersed in water. There are some shortcomings here, but it is not all bad. 40 to 90 PSI with 1400 pulses per minute. Built into the handle of the Broadcare water flosser is a lithium-ion battery. The exact capacity or usage time is not quoted by the manufacturer in any of the documentation or marketing materials, so officially I can’t say what the battery is supposed to deliver or what the manufacturer expects you to get. Our testing has revealed that you can expect 160 minutes of usage time from a full charge. That is a long time! I can’t say everyone will get such performance but even half of this is still extremely respectful. How long each user uses for each day will vary. The tank lasts 30-35 seconds. It also depends on whether you floss once a day or twice a day or more. Taking a conservative view, let’s assume the flosser is used by 1 person, twice a day for 1 minute at a time, so 2 minutes a day that’s 80 days, or approximately 2.5 month’s between charges. Amazing. To charge the battery you must use the provided charging cable. It is a 2 pin US power adapter with support for 100-240v. The cable at the other end is a proprietary connector that is found on the front of the flosser. It can take up to 8 hours to charge and when charging a Blue LED flashes on the handle. This is the LED above the ‘CH’ lettering. When the battery is low this icon will flash when the flosser is in use and just after to alert you to this fact. It would be nice if you got a bit more indication for example a percentage (%) or maybe 3 lights that made up a battery. However, given the usage time it is not a big issue that this is not present. Lasts approximately 160 minutes which is 80 days based on 1 user flossing once a day for 2 minutes. It would appear that Broadcare sell this only though Amazon within the US with a selling price of $30-35. On the face of it, this price seems very reasonable and in many respects it is considering what you are getting. As the market leading brand, it makes complete sense to compare this to Waterpik. For just a few dollars more you can get (at the time of writing anyway) the Waterpik Freedom Cordless for about $40. This doesn’t actually offer as many features as the Broadcare, despite being more expensive. Whether you need the extra features Broadcare offers in comparison to the peace of mind that comes with the Waterpik brand, this is a personal decision for you to make. More closely matched is the Waterpik Cordless Advance, but at an extra $40 over the Broadcare, for no ‘significant’ additional benefits aside from brand it is a harder justification and the appeal of the Broadcare is apparent. Ultimately the act of flossing or interdental cleaning of some form is better than nothing. The Waterpik options are perhaps technically a bit better, you are paying for the brand name to some degree and the peace of mind that comes with having an ADA accepted product. How much is this peace of mind and ADA approval worth? If you really want to get the most you can for your money, then Broadcare is a better option. Particularly is you are constrained by what you can spend. However, buying Waterpik may give you some intangible benefits and get the approval of your dentist too. With these products you do need to factor in the price of replacement nozzles too. This helps give an idea of the lifetime cost. Generally you will want to replace the nozzle every 3 months. A pack of 5 costs $8 and lasts 6 months, so at $1.60 each they are really cost effective. Although this has a warranty of just 15 months, we like to price things over a 3 year period as this tends to be the typical lifetime of such products. So $30 purchase price plus 2 packs of nozzles at $8 each gives a cost over 3 years of $46 or 4 cents per day. Waterpiks equivalent costs 8 cents per day, but traditional string floss, that works out at about 1-2 cents per day. It is an alternative solution to normal flossing that you might get along with better and some of the convenience is definitely worth paying for. This is the first Broadcare product I have used, so I have no experience of the brand. My initial and lasting impressions of the product are very good. Given the price I have been very surprised. Yes, of course the construction is plastic rich but that is to be expected. If you really analyse the build there are a few areas where it could be improved. In particular I did find the ejector button to be a bit stiff. The cover that goes into the power socket is also easy to lose. It won’t affect the operation of the unit, but I can see it being easily mislaid. It comes with a warranty of 15 months which slightly unusual, but I am not knocking it. Often they are 12 or 24 month warranties. Whilst it should last longer than the 15 months given the price I have to suspect it is a ‘throw away’ product and I do not have quite the confidence as I do in some bigger brand products. Waterpik might be the market leader. There is a certain level of refinement to their product, potentially a slightly better box contents and maybe better performance. But for around half the price the Broadcare unit is a very respectable alternative that deserves a fair bit of praise. It is not perfect, the build quality could be better but the battery life and features are a winning combination, making for a much more enjoyable experience than normal flossing. It lasts 160 minutes which is equivalent to 80 days based on 1 user flossing twice a day for 60 seconds a time. Yes, a mains charger is included in the box. Nozzles should be replaced every 3-6 months. Can I use mouthwash in the Broadcare? Approx 150m/5.2ozl which will last for 30 seconds. Can I use the Broadcare flosser in the shower? It is IPX7 rated, but we would advise avoiding using it in the shower. Do you own or have you used the Broadcare cordless water flosser?